They may seem innocuous enough, those small planes used for weekend getaways, flight training, small freight deliveries, and other civilian purposes. 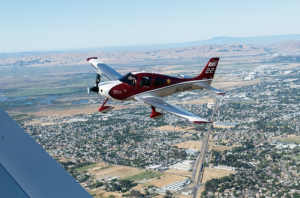 But collectively, the more than 167,000 piston-engine aircraft that comprise the majority of the U.S. general aviation (GA) fleet may pose a significant health threat. That’s because these vehicles, which rely on leaded fuel to operate safely, constitute the nation’s largest remaining source of lead emissions. Those exposed to low levels of lead, especially children, have been shown to suffer neurological and cognitive impairment, including IQ loss. Unlike commercial airliners, which do not use leaded fuel, and automobiles, which went all-unleaded by 1995, piston-driven GA aircraft account for about half of anthropogenic lead emissions in U.S. skies. But just how much of an impact is this airborne lead having on the nation’s public health and economy? To answer that question, a team of MIT researchers has conducted the first assessment of the nationwide annual costs of IQ losses that can be attributed to aviation lead emissions. The team found that each year, these IQ losses result in about $1 billion in damages from lifetime earnings reductions, with an additional $0.5 billion in economy-wide losses due to decreases in labor productivity. Its findings appear in the journal Environmental Science and Technology. Conducted by researchers affiliated with the Joint Program on the Science and Policy of Global Change, the Center for Environmental Health Sciences and the Laboratory for Aviation and the Environment, the study is unique in its inclusion of lead emissions incurred not only on takeoff and landing, but also during the cruise phase of GA flights. Previous investigations of GA-based lead emissions focused primarily on health impacts at local airports and regions, and did not explore economic damages. To obtain their results, the researchers developed an inventory of general aviation emissions across the continental U.S., and modeled its impact on atmospheric lead concentrations using the Community Multi-Scale Air Quality Model (CMAQ). Based on these GA-specific contributions to overall atmospheric lead levels, they quantified associated IQ deficits nationwide and their annual economic impacts. They estimated annual losses in lifetime earnings potential using earnings data from the U.S. Department of Labor’s Bureau of Labor Statistics, and annual losses in labor productivity using a Joint Program computational general equilibrium model called USREP, which models the U.S. economy. Efforts to curb leaded emissions from GA aircraft have been underway for at least a decade. Petitioned by the environmental nonprofit group Friends of the Earth (FoE) in 2006 to address the problem of leaded emissions from GA aircraft, the Environmental Protection Agency proposed limiting such emissions in 2010, but has yet to issue a ruling. The FoE claims that 70 percent of GA planes could switch to unleaded fuel without retrofitting. Toward that end, the Federal Aviation Administration aims to certify and distribute an unleaded replacement fuel by 2018. This research was supported by the MIT Center for Environmental Health Sciences with funding from the National Institutes of Health.